We’ve talked before about Choza de Margarita and how we enjoyed some of the upscale on the go offerings we’ve tasted there. It is a credit to the entire Mexico pavilion that just about every spot to grab a bite to eat or something to drink within, and outside of, the pyramid is a place that I regret not visiting if I can’t get there on a particular trip. As Choza de Margarita is still relatively young in its lifespan, let’s head back today to sample a bit more of the menu. This time we’ll focus in on a dish and a margarita that are a bit more traditional, but with that typical Choza twist. Guacamole may not sound like a must try dish to you, but in our house it’s a common staple to have on hand. Sometimes we make it ourselves, and sometimes we leave it up to the capable hands of our local grocer, but it is something that we keep around. The guacamole at Choza de Margarita takes what you know and love about guacamole, the avocado, a bit of heat, and seasoning, and ramps it up with mango and pumpkin seeds. Then, instead of tortilla chips, it comes with fried flour chicharróns that are drizzled with salsa valentina. A lime also accompanies this dish to add as you see fit. The mango is a refreshing addition to the guacamole and adds the brightness of lime without as much acidity, while the pumpkin seeds add some texture to the otherwise silky smooth guacamole. 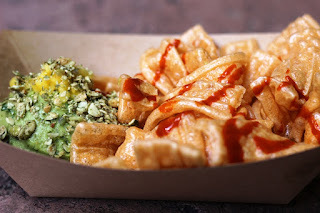 The fried flour chicharróns are wonderful scoops and can hold an extra-large dollop of guacamole that you typical chip would crack beneath. They are like air puffed pillows of salt and heat and they’re perfect alongside the fattiness and fresh flavors of the guacamole. There is definitely more than enough to share in a single portion, and it will really hit the spot if you’re looking for something to tide you over between meals. To wash the guacamole down, we opted to go a hair up from the traditional margarita, and instead picked up Choza de Margarita’s Lime Cucumber Margarita. This beverage includes Libélula Joven Tequila, fresh cucumber juice, Combier Orange Liqueur, and agave nectar with Tajín Chile-lime powder on the rim. 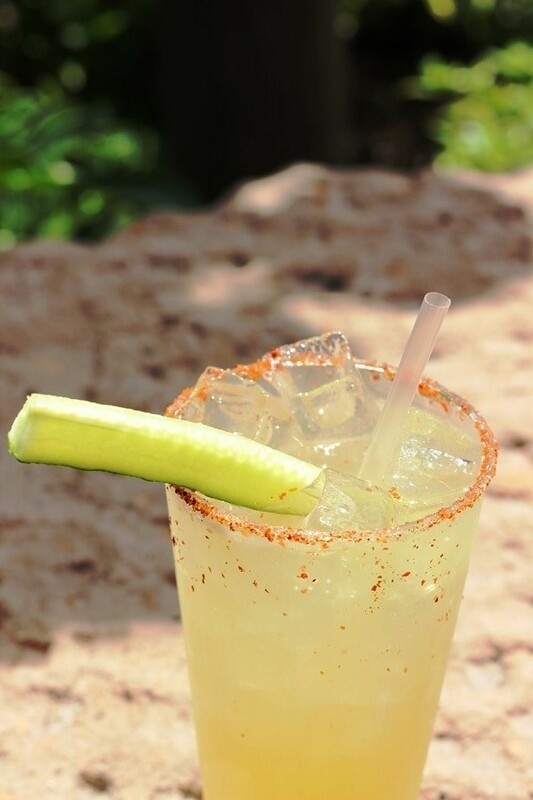 The difference between this and the traditional margarita offered at Choza is the type of tequila used, the addition of cucumber juice, and the rim, which in the traditional version is a black ant salt rim. As much as any margarita can be, the Lime Cucumber Margarita is as refreshing as it gets. The cucumber is mellow and spends most of its time in the background, allowing the lime and orange liqueur to do the heavy lifting. The cucumber juice comes through enough to cool off the harsh edges of both and leave you with a pleasing aftertaste. The Tajín Chile-lime powder will give you a kick each time you place your lips to the glass, but if you stay in one spot, that effect will obviously dissipate as you continue sipping on your margarita. Overall, the Cucumber Lime Margarita is extremely flavorful, but not overbearing, and is definitely something I will add to my regular rotation. With a couple of dishes and a handful of margaritas under my belt, I can safely state the Choza de Margarita is representing well the recent trend of great food and drink in the Mexico pavilion. If you’re on the go between stops, or just simply don’t want to wait to get a table at La Cava del Tequila, Choza de Margarita is definitely a place to check out. If you’ve been before, give something else on the menu a try, because from my sampling they will not disappoint you!